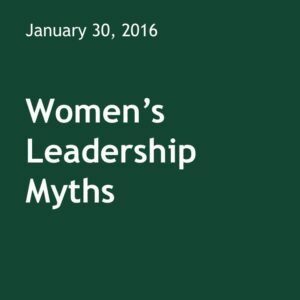 We’re excited to announce that today we’re launching a 16-part blog course highlighting women’s leadership myths. Every two weeks, we’ll send you tips, strategies and exercises for you to try on your own and share with your team. Based on our research, both men and women equally – especially in the Millennial generation – need and more importantly, demand flexibility. We’ve been hearing all around the country that dads want to be involved in their family affairs as much as their female counterparts. No wonder that the DOL issued a new policy of paternity leave and books like All In by Josh Levs, a former CNN journalist, are popping up right and left. As a result, flexibility is no longer an obstacle but rather a prerequisite that fuels workforce high performance and leadership pipeline regardless of gender. Let’s reframe by stating that both women and men need flexibility and support so they can build and lead a meaningful career. That could mean helping busy professionals outsource domestic duties. It could mean encouraging your female employees to enlist their spouse’s help. It could mean your female potential leaders need a bigger challenge to engage them more meaningfully in their work. It also could mean that everyone gets more flexibility in how they accomplish their goals rather than slavishly coming to work at set times. Flexibility helps everyone. Everyone wants to be successful at work and build a meaningful career. Ask your team as to how they view flexibility and what support they might need to be more successful at work and build a more meaningful career. And let us know what they think by leaving your comments below. Upcoming event: we’re hosting a VIP event on Tuesday, April 5, 2016 at 12pm at the Cambridge Innovation Center downtown Boston for our female executive clients, the media, and other influencers in the women’s leadership space. We only have a few spots left so please hit ‘reply’ if you or your colleagues are interested in attending. Interested in a interested in a FREE women’s leadership assessment for your company plus a 30-minute consultation to review results, please click here and complete our simple Contact Us. Kelly Watson and Jodi Detjen are on a mission to bring a practical and outcomes-focused approach to workforce management in order to strengthen a new pipeline of women in leadership so businesses can use all the talent available. This 16-part blog series is the result of more than 30 years of corporate and small business experience in an attempt to challenge the outdated myths and assumptions about women’s leadership and get more women in leadership roles and on boards. Learn more here.